Posted July 28th, 2015 at 11:17 am. Ana Cordova ’13 knows how lucky she was to be recruited in high school to participate in Bright Prospect, a program that helps high-achieving students from low-income families attend college. But Ana also knows that not every student has the support in place to even get to the point to be considered for such a program. 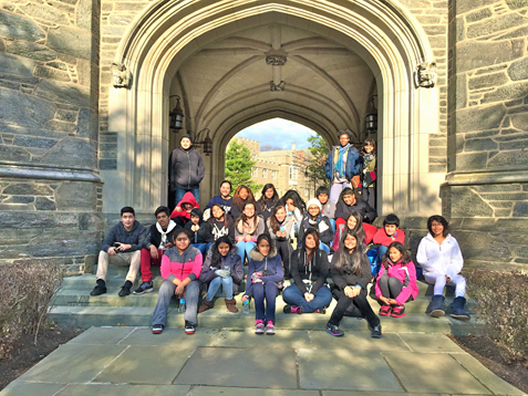 So when the opportunity came up to head Adelante—a science, technology, engineering, and math (STEM) college access program for middle school students in the Norristown Area School District—Ana jumped at it. Adelante (“forward” in Spanish) is one of several partnerships between Accíon Comunal Latino Americano de Montgomery County (ACLAMO) and Bryn Mawr’s Civic Engagement Office. Launched in January of 2014, funding for the program is through a VISTA grant from Pennsylvania Campus Compact. As part of the program, Adelante staff and volunteers meet with 10-15 middle school students from the Norristown Area School District weekly on Saturday mornings for college-prep workshops and STEM-related activities. The goal of Adelante is that the students involved develop aspirations for higher education, enter high school ready to overcome any academic challenges they may encounter, and do it with the support of their peers and their parents. Faculty members from a number of Bryn Mawr departments including geology, biology, physics, and mathematics have been involved with the program, as well as members of Bryn Mawr’s admissions office. The program also includes monthly meetings attended by the parents of the Adelante students. This summer, a new element has been added to the program. The Leadership, Innovation, and Liberal Arts Center (LILAC) is funding a summer intern, who is coordinating a special summer academy held on Bryn Mawr’s campus for students who have been in the program and are now heading off to high school. This year’s intern is Stephanie Montalvan ’18, who, as a Posse Scholar, also understands the impact programs like Adelante can have on the lives of students. This year’s academy hosted 10 Adelante students who spent the week focusing on what college life is like, disciplines of study within STEM, and how college can transform their futures. Assistant Professor of Geology Pedro J. Marenco and Professor of Education Jody Cohen, who are among the faculty members to participate in the program, are hoping to expand the work of Adelante even further. The two have applied for NSF funding to develop a tiered mentoring program as part of Adelante. Students taking part in Bryn Mawr’s Praxis program will serve as mentors. The program is also possibly branching out to include other colleges. Akshaye Dhawan, an associate professor of mathematics and computer science at Ursinus College, is interested in connecting his school’s chapter of the Association for Computing Machinery with the program. Dhawan plans to have Ursinus students work with the high school students of the Adelante program to learn about programming and coding. Bryn Mawr College students interested in volunteering with Adelante should contact Ann Tran ’18 and Miriam Myers ’18, the Adelante student coordinators, for a volunteer application.